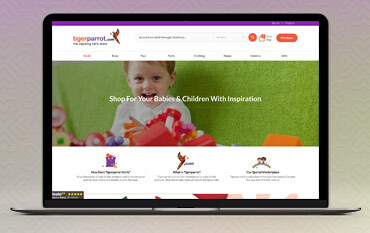 Tiger Parrot stock a huge selection of baby products including baby clothing, footwear, nursery furniture, decor sets, playtime and learning products, car seats, pushchairs, carriers, feeding products, bathing and changing products, maternity and pregnancy essentials and christening and baby shower gifts. Tiger Parrot also sells a wide selection of clothing, accessories and footwear for girls and boys, plus party decorations, party bags, party essentials, tableware, fancy dress, party games, activities, cakes, food and much, much more. If you’re looking for toys you can find figures, playsets, dolls, soft toys, arts and crafts, construction toys, gadgets, electronics, musical instruments, school essentials, toy vehicles, educational toys, games and puzzles, bikes, ride-on's, furniture and frames, sports and outdoor games, toys for children with special education needs, books, DVDs and video games. If it’s nursery and bedroom furniture you need you can find it all at Tiger Parrot too, as well as furniture and accessories for playrooms, bathrooms, the kitchen and the garden. Tiger Parrot sells a great selection of products for children who enjoy hobbies. Discover essentials for hobbies like music, dance, gymnastics and sports hobbies such as cycling, skating, swimming, watersports, racket sports, football, rugby, cricket, golf, hockey, basketball, netball, table sports, darts, skiing, snow sports, martial arts, athletics and outdoor adventures. You can discover products for all these hobbies from huge brands like Adidas, Champion, Speedo, Zoggs and many more. You can also shop for all these products by price to find affordable items, all of which come with free delivery. If you’re looking for gifts for newborns, baby showers, new mums or christenings you can find them all at Tiger Parrot. You can also discover personalised gifts for baby boys and girls as well as stunning handmade cards that will add that extra special touch to your gift. The gifts available at Tiger Parrot include things like personalised signs, present sacks, jewellery boxes, babygrows, wooden toys, bibs, crochet toys and much more. All the gifts available come from huge brands in the children’s industry such as Best Years, Ella James, Melissa and Doug, Mum 2 Mum, Swanky Portraits and much more. They’re also all extremely affordable, made even more affordable when paired with a discount code from us. You will be charged the current VAT rates for the United Kingdom only on applicable items ordered. Some baby and children's items are exempt from VAT and for these items no VAT will be charged on your order. You have 14 days to return an item to Tiger Parrot. How can I contact Tiger Parrot? Tiger Parrot brings together the best baby and kids products from exceptional brands and retailers around the UK. Gain access to hundreds of the best children’s products such as clothing, toys, party products, homeware and gifts from the best boutiques, high street shops and online retailers. Discover kid’s clothing in baby sizes up to older kids sizes as well as toys and accessories for all ages and stages of childhood and use a Tiger Parrot discount code from us to save money on all this and more when you shop online at Tiger Parrot. You can also enjoy incredible savings in the offers section and when you sign up the newsletter.